New Delhi/Mumbai: The Congress-led United Progressive Alliance (UPA) government, succumbing to pressure from allies, has put the brakes on what would have been a showpiece reform—allowing overseas retail companies to enter the country by owning up to 51% in departmental stores and similar multi-brand shops. The UPA on Monday told the opposition that it has suspended the initiative, but the opposition is sticking to its demand that the cabinet decision be scrapped. The Congress is also on the edge ahead of a key ruling by a Central Bureau of Investigation (CBI) special court into the allocation of second-generation (2G) spectrum. At stake is the political fate of senior Congress leader and home minister P. Chidambaram. The Congress has issued a three-line whip to its Lok Sabha members asking them to be present in the House on 7 and 8 December. Indian industry said the confusion and delay over policy decisions will further discourage investment, posing a risk to already slowing economic growth. The government’s compromise formula—to hold rather than abandon the decision—is unacceptable to the opposition. The government has agreed to the opposition’s demand for an all-party meeting, which is scheduled to be held on Wednesday morning, to discuss the issue. Both houses of Parliament have been unable to conduct any business because of vociferous protests by the opposition since the 24 November cabinet decision, which also raised the limit on overseas investment in single-brand retail to 100% from 51%. Parliament is scheduled to resume on 7 December. Political observers said the climbdown will further damage the government’s credibility and the image of Prime Minister Manmohan Singh, who had thrown his weight behind the reform measure and said there would be no rollback as the country would benefit from the move. The government was forced to review its decision after one of its key allies, West Bengal chief minister Mamata Banerjee, whose 18 members support the UPA government in the Lok Sabha, refused to back the decision. A week after Singh declared the step had not been made in “haste, but after a lot of consideration", finance minister Pranab Mukherjee called Bharatiya Janata Party (BJP) leaders Sushma Swaraj and L.K. Advani and informed them that the government was “holding back" the decision on foreign direct investment (FDI) in retail. Mukherjee also spoke to Communist Party of India-Marxist leader Sitaram Yechury, who said that the move was being kept “in abeyance". “Mukherjee told me the government is interested in making a statement on the issue in the Lok Sabha," Swaraj, leader of the opposition in the Lok Sabha, said in Indore. Swaraj had demanded that there should first be an all-party meeting at which the government should make its stand clear. The government has since conceded the demand for such a meeting. The opposition has opposed FDI in multi-brand retail saying that it will damage the interests of small family-owned stores. The political developments over FDI showed “the Congress’ inability" to run the coalition effectively, said Sandeep Shastri, pro vice-chancellor, Jain University, and director, International Academy for Creative Teaching, Bangalore. “The Congress should have been prudent enough to ensure that it has the support of its own house at least. It has not been able to manage its coalition, it has not yet fine-tuned the art of managing the coalition," he said. Shastri said that the uncertainty over the move was “undoubtedly" a setback to the Prime Minister’s image. “He has to keep in mind that he is leading a coalition government in which each pinprick has to be taken care of," he added. Senior Congress leaders, including some ministers, had questioned the timing of the decision, which had been opposed by the Left and some UPA allies for a while now, and said the government should have waited for crucial assembly elections in some states, including Uttar Pradesh, due next year to get over. The BJP, the main opposition, focused its criticism on Singh. “Where is the PM? He took it as an issue, but (his ally) Mamata says ‘roll back’—his allies are not with him," said Ravi Shankar Prasad, BJP spokesperson. “This PM is not seen anywhere. The PM, in a democracy, is the biggest political post and the last word should end at his table. (The present situation) raises questions on his office and his authority is debatable." BJP leaders had indicated earlier that the party would move another notice on an adjournment motion—a debate followed by a vote—in the Lok Sabha on Wednesday if the government didn’t convene an all-party meeting. Industry, which had welcomed the FDI decision, is waiting for the smoke to clear. The world’s largest retailer by revenue, Wal-Mart Stores Inc., has a 50:50 joint venture (JV) with Bharti Enterprises. The JV has been operating in India for the past four years and has 15 cash-and-carry outlets under the BestPrice Modern Wholesale banner. “We have no comments to make," said a spokesperson for Bharti Walmart Pvt. Ltd.
Govind Shrikhande, managing director and chief executive officer, Shoppers Stop Ltd, which runs a departmental store by the same name and hypermarket chain HyperCity, said: “I’d wait for more clarity from the government side." A spokesperson for Future Group, parent of Pantaloon Retail, also declined to comment until there was more clarity on the issue. Allowing FDI will greatly improve investment sentiment, said B. Muthuraman, president, Confederation of Indian Industry (CII). “CII hoped to see an early consensus on the issue among the political leadership of the country," he said. “It is in the national interest and, therefore, we are hopeful that all significant political stakeholders would converge on the subject soon." Pantaloon and others have actively backed FDI in retail as it would offer an avenue for raising resources to fund expansion. The firm has ₹ 5,400 crore of debt on its books, according to an MF Global Sify Securities India Pvt. Ltd report on FDI in retail. 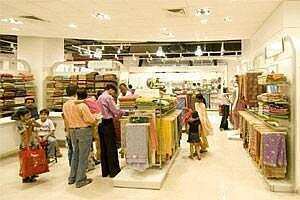 “Pantaloon stands to gain the most if FDI in retail is allowed," said the report. “We don’t expect foreign retailers to start negotiations or look for partners in India until there is clarity," said Abhishek Ranganathan, analyst at MF Global. Single-brand retailers such as Ikea and Hennes and Mauritz (H&M) welcomed the move for 100% FDI, said Lars-Olof Lindgren, Sweden’s ambassador to India. “However, they could not announce investment plans as they wanted to see the policy guidelines first," he said. Implementing the policy would lead to companies sourcing more from India, thus creating job opportunities, he said in a briefing about a business climate survey conducted by the Swedish trade council. Ikea Trading (Hong Kong) Ltd India, the local arm of one of the world’s leading home furnishing firms, is headquartered in Gurgaon and employs 140 persons with an annual revenue of $645 million (Rs 3,315 crore today). H&M is a fashion clothing company and employs 119 people in India. Appu Esthose Suresh and Asit Ranjan Mishra in New Delhi, and PTI contributed to this story.